I decided that I need a system that can do stereo and go quite loud with better sound quality then my small TDA7052 system. I noticed that my local retailer, Maplin, have extended their low cost speaker range. See their site here. These speakers are small in diameter and height and have notably good quality for their size, and handle around 3W. Unlike other speakers at their size, these speakers have higher power handling and a rubber surround and look and feel a lot heavier then most other cheaper versions, i.e. ones found in small TV's and clock radios. With these two of speakers, two cases and a TDA2822 amp on one PCB, I have made quite an impressive system that is small in size. 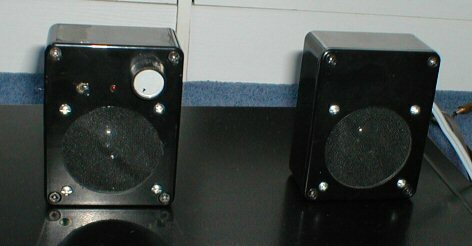 The picture above shows the two speakers complete, the box on the left contains the amplifier and the controls. The box on the right is just another speaker and a set of 4 AA batteries. You can see from the front view that their is a power switch, a power LED and a volume control - again minimal controls as nothing else is really needed and just takes up space. You can also see that I gave up on the idea of drilling lots of holes for the sound to escape and have instead cut a large hole and used speaker grill instead, which actually looks quite nice. The picture above shows the cover taken off both the boxes. The one on the left is the one with the amplifier in, the right speaker just contains additional batteries. You can see how the amplifier is slotted into the space above the speaker using the slots the box already has inside. The PCB is again one of my home made ones that was designed and etched by myself and works well. You can also see the back of the speaker, the size of the magnet gives you an idea of the quality of these speakers compared to others at their size. This is a picture of the PCB taken out of the box, you can just see that there is a TDA2822 chip with 5 electrolytic capacitors, and 2 mylar capacitors. Other components include two 3.5mm PCB jack sockets, one is the line input, the other is a speaker out for the other box. 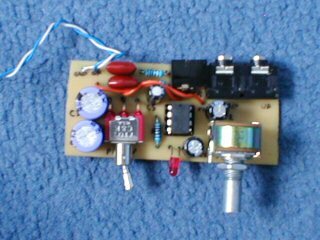 There is 2.1mm PCB power plug socket too for the power, one dual gang volume control as their are two channels to adjust the volume of (stereo), a power LED and its resistor and a power switch which is a PCB toggle switch. The only wires leaving the board are for the speaker that is inside the same box. You can also see various jump wires as I needed to keep the board size small. Performance is very good indeed, the volume is quite incredible at the size these speakers are (that being 100 x 76 x 41mm). In the other speaker box, I have placed a battery holder that holds 4AA batteries, giving me 6V. It "just" about fits in the area above the speaker, which is convenient.